Platinum first came to Europe in the form of platina, grey metallic crumbs that were unusable to metalworkers in their native form. When platina is dissolved in aqua regia, a mixture of strong acids, a dark insoluble residue is left behind. An English chemist named Smithson Tennant was the first to experiment extensively on large quantities of this residue, eventually convincing himself and announcing to the world in 1804 that it contained two new elements: osmium and iridium. While osmium was named for the pungent odor produced by its oxide, iridium was notable for the many vibrant colors of its salts, leading Tennant to derive its name from Iris, the Greek goddess of rainbows. All of the platinum group metals are known for being hard, fairly non-reactive, and performing well under high-temperatures, but iridium stands out in these regards even within this small family. It is the most corrosion-resistant of all metals, is extremely hard, and has an extremely high melting temperature--2466 degrees Celsius. While iridium metal’s resistance to change is extremely desirable in some applications, the tradeoff is that solid iridium is too hard and brittle to work or machine and melts at too high a temperature to make traditional casting practical. The limited options for techniques to work with iridium significantly limit applications of the pure metal, but the one of the few that exist drives much of the demand for the element. The primary use of pure iridium is in crucibles for procedures that must be carried out under extremely high-temperatures. Most notably, these crucibles are essential for the production of many high-purity single-crystal materials, including semiconductors, garnets used in lasers and industrial welding, synthetic sapphire for electronics applications, silicate crystals used in sensors, and lithium crystals used in electronics. Other uses of pure iridium include encapsulation of the plutonium-238 fuel in radioisotope thermoelectric generators of unmanned spacecraft, the production of antiprotons for particle physics experiments, and the production of mirrors used in x-ray optics applications. Additionally, radioisotopes of iridium are used for gamma-radiography for testing of metals, as well as for some forms of medical radiotherapy. Most other applications of iridium use it combination with other elements. In alloys, it imparts increased hardness and resistance to corrosion and heat. These alloys are used in a range of applications where the material chosen must withstand substantial wear from use or extreme environmental conditions. Historically, iridium alloys were sought after for fountain pen tips and components of cannons that suffered from significant wear, while modern uses include electrical contacts for spark plugs, microelectrodes for use in electrophysiology, and extremely resilient aircraft engine parts. A platinum-iridium alloy was also used to construct the international prototype meter and kilogram mass in 1889, and the kilogram prototype is still in use as the international standard for mass. Iridium compounds are frequently used in research and industry as chemical catalysts. Like other platinum group metals, iridium is typically obtained for commercial use as a byproduct from nickel and copper mining and processing, but can also be obtained from ores rich in platinum and from alluvial deposits. Iridium is alloyed with platinum to produce highly corrosion resistant electrical contacts for spark plugs. Iridium is available as metal and compounds with purities from 99% to 99.999% (ACS grade to ultra-high purity). Elemental or metallic forms include pellets, rod, wire and granules for evaporation source material purposes. Iridium nanoparticles and nanopowders are also available. Iridium oxide is available in powder and dense pellet form for such uses as optical coating and thin film applications. Oxides tend to be insoluble. Iridium fluoride is another insoluble form for uses in which oxygen is undesirable such as metallurgy, chemical and physical vapor deposition and in some optical coatings. Iridium is also available in soluble forms including chlorides, nitrates and acetates. These compounds can be manufactured as solutions at specified stoichiometries. Iridium is a Block D, Group 9, Period 6 element. The number of electrons in each of iridium's shells is 2, 8, 18, 32, 15, 2 and its electron configuration is [Xe] 4f14 5d7 6s2. 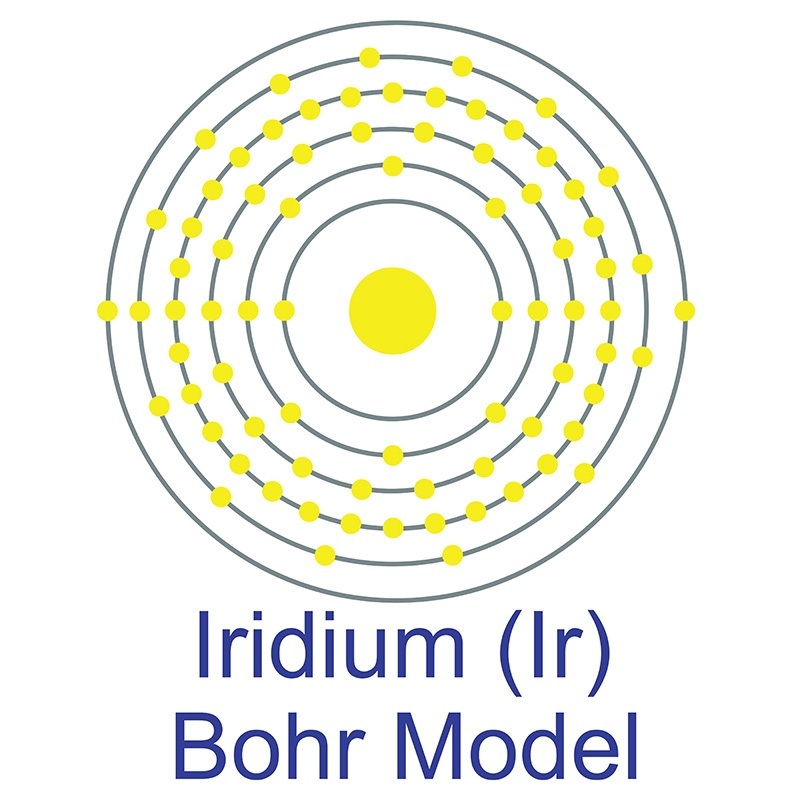 The iridium atom has a radius of 135.7.pm and its Van der Waals radius is 202.pm. In its elemental form, CAS 7439-88-5, Iridium has a silvery white appearance. Iridium is a member of the platinum group of metals. It is the most corrosion resistant metal known and is the second-most dense element (after osmium). It will not react with any acid and can only be attacked by certain molten salts, such as molten sodium chloride. Iridium metal is found alone and in alloys with other platinum group metals. Iridium was first discovered by Smithson Tennant in 1803. Iridium's name is derived from the Greek goddess Iris, personification of the rainbow, on account of the striking and diverse colors of its salts. Iridium is only slightly toxic in its elemental form; however, safety data for Iridium and its compounds can vary widely depending on the form. For potential hazard information, toxicity, and road, sea and air transportation limitations, such as DOT Hazard Class, DOT Number, EU Number, NFPA Health rating and RTECS Class, please see the specific material or compound referenced in the Products tab. The below information applies to elemental (metallic) Iridium. that have to be monitored at the workplace. There are two natural isotopes of iridium (Ir): 191Ir and 193Ir.